Dear all, it’s already at the end of August. How was your Summer this year? Let’s see how K-pop idols enjoyed their Summer in Gangwon! Rachel from APRIL and Jisook (former member of Rainbow) took a sea train from Jeongdonjin in Gangneung to Samcheok. They were amazed with crystal clear ocean water and had fun in train ride! The Sea Train is a tourist train, travelling along the Western sea, comprised of four divided cabins including two special rooms, one standard room, and one family room. The Sea Train has plenty of things to see as it was decorated with a marine theme, including trick art images of clams, ocean creatures and shark as well as unfolded ocean views looking through the windows. Love tree is a 300-years-old zelkova tree located inside Hwacheon arboretum alongside Bukhangang river. It is not clear why this tree is called as love tree though, many photographers come visit here to capture the simple and peaceful view of the river, wildflowers and this love tree. Minhyuk and Eungwang from BTOB visited Inje in Battle Trip. Look how they enjoyed Makguksu (Cold buckwheat noodle) Gangwon’s signature food at the best! A giant roll with noodle for Minhyuk > < After hearty lunch, they went for fun amphibious ATV riding. Look at their rough drift! 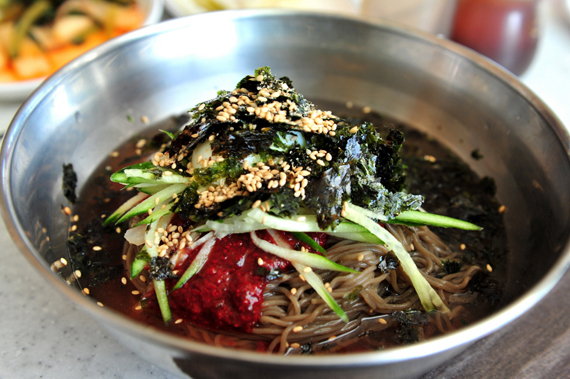 Makguksu, one of the representative local dishes of Chuncheon is a cold buckwheat noodle with a spicy sauce. Amphibious ATV experience is available in Argo experience center in Inje county. Argo experience center is run by agricultural association of Namjeon-ri in Inje. They started to have amphibious ATV crafts since 2006. Coincidentally, there was a massive flooding in Inje in 2006 and these ATV crafts (called as “Argo”) moved around to save flood victims and deliver relief goods. With 8 wheels, Argo can ride over the steep uphill road, bumpy pebbled road and even the pool. And of course in the water, Argo is floating like a boat and generates the power by wheel spinning.